Many people are interested in Mormonism because of Mitt Romney. Others have Latter-day Saint neighbors or do business with Mormons. In many ways, they are quintessentially American, yet they also have a distinct culture and identity. Who are these people? What makes them tick? How do they live? And how can we have meaningful faith conversations with them in ways that connect rather than divide? This book is a sympathetic description of LDS life from the perspective of traditional Christianity. Many good resources explain Mormon beliefs. But this book breaks new ground by exploring Latter-day Saints as a people. It explores LDS culture to explain how the Mormon identity is shaped, how Latter-day Saints live out their values in private, in the family, the local congregation, and the larger Church, and how they typically interact with the non-Mormon community around them. The book applies this understanding to give suggestions about how traditional Christians can engage Mormon friends and neighbors in constructive conversations about faith. 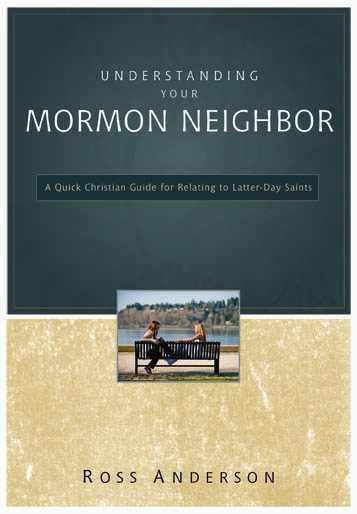 Understanding Your Mormon Neighbor (Zondervan, 2011) is available at our Online Store.